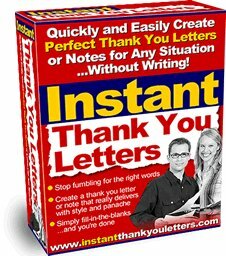 Instant Thank You Letters helps people quickly and easily create powerful appreciation notes or letters guaranteed to make that perfect impression... for any professional or personal situation. It's ideal for job hunters, sales professionals, business people, brides, or just about anyone. Stop struggling to write perfect notes of appreciation and letters that make the right impression. Just click the image below for the "Instant" Solution. Stop suffering through the pain and hassle of trying to write a letter or note for any situation where you need to really deliver with style and panache. Now, you can simply fill-in-the-blanks...and you're done in about 2 Â½ minutes -- flat! Perfect for emails, letters or handwritten notes or anything you need.